Presentation was informative and they were great. Explained everything they were doing. This system kept my house dry as heck during the rain storm. Thanks Dan McNally, JeffNero, Tom Carrano and Quality 1st Basements! Basement use to flood weekly. Tom is a graduate of Oral Roberts University with a Bachelors in Arts of Psychology and a minor in Business. Tom also has a Sales Management Professional Certificate from Rutgers University School of Business. Tom’s worked in the sales and customer service industry for over 12 years. With these 12 years of experience, he understands the importance of bringing top quality customer service to each and every homeowner he meets. Tom finds great satisfaction knowing he is able to help homeowners and provide them with WOW service. When Tom isn’t out visiting homeowners or in the office, he is spending quality time with his two daughters. Tom is a family man since he comes from a large Italian family. He enjoys planning day trips and activities for his family to do. Tom is a great cook and loves cooking on his grill for his family and friends. A homeowner living in Moorestown noticed their sidewalk near their home had settled a few inches, which created a tripping hazard. The homeowner contacted Quality 1st Basements as they would offer the best solution to the homeowner's problem. Now the homeowner is relieved that the tripping hazard has been removed thanks to Quality 1st Basements. This homeowner was experiencing concrete settlement due to soil eroding beneath the concrete slabs. After our PolyLevel team injected polyurethane formula beneath the settling slabs, the deck was raised back to its original position. The PolyLevel process is quick and causes minimal disruption. This homeowner was able to enjoy their pool within 15 minutes of the installation being completed! A trip hazard in your driveway can cause a serious accident for family and friends coming and going from your home. When this homeowner noticed how much their driveway had settled, they contacted Quality 1st Basements right away for a solution. System Design Specialist, Tom C. inspected the driveway area and recommended our PolyLevel would be the best solution virus replacement. The number one cause of concrete settlement is the soil beneath the slab. If the soil becomes too wet or too dry it weakens and can no longer support the weight of the slab therefore causing the slab to sink. Replacing it would only be a temporary solution and so therefore the homeowner agreed PolyLevel would be the best option. PolyLevel Foreman, Rich and his team drilled small penny-size holes into the concrete and injected our PolyLevel foam underneath. The foam expands, raising the slab back to level and then hardens to permanently stabilize the slab. Within just 15 minutes of completion the homeowners car could be driven over the slab and into the driveway. A homeowner from West Windsor Township had noticed that their patio around their pool had sunken about one to two inches which created a tripping hazard. The homeowner contacted Quality 1st Basements, looking for someone to provide a solution to their concrete problems. System Design Specialist, Tom Carrano, examined the homeowner's patio and recommended PolyLevel. Polylevel is lightweight and won't wash out making it the perfect solution. The Project Manager and his crew injected PolyLevel into the sunken slabs, quickly raising them back to level. With the sunken slabs raised the homeowners could enjoy their patio and pool. Barnegat, NJ homeowner contacted Quality 1st Basement Systems about concrete lifting and leveling. The back patio area of their home had begun to sink and settle causing gaps in the concrete. Not only had the gaps become an eye sore but also tripping hazards had formed. The homeowner loved the patio area and so replacing it was not an option. Luckily, System Design Specialist, Tom Carrano, suggested PolyLevel to raise and elevate the patio area, removing not only the gaps but the tripping hazard as well. A homeowner in Manahawkin, New Jersey had a concrete walkway leading up to their front door that was settling about an inch. PolyLevel is a polyurethane foam that is injected into the concrete through penny-size holes. The foam begins to expand and lift the concrete back to its original position making it the perfect solution for the settling this homeowner was experieincing! PolyLevel is a fast and permanent solution to concrete lifting and leveling. The homeowner was amazed at how professional our crew was and how clean they left the are once the job was completed. A homeowner in Berkeley Township, New Jersey noticed their landing had settled 2 inches. At the end of the driveway there were puddles of water collecting in the settlement. The homeowners contacted Quality 1st for a solution. Our crew used PolyLevel, a polyurethane foam to lift the concrete back to its original position. To do this, the foam was injected into the concrete through penny-size holes. After 30 minutes, the foam begins to harden and raise the concrete. This PolyLevel method is fast, easy, and permanent. Sinking slab raised on the side of this Toms River, NJ home leading towards the backyard! The patio around this beautiful pool area had begun to settle causing gaps in between each settled slab. The patio furniture was no longer secure due to these uneven slabs. The homeowner contacted their local concrete raising experts for a free estimate on a permanent solution. Quality 1st Foreman, Arturo and his crew drilled small holes into each sinking slab. Using special technical machines, PolyLevel foam is injected underneath to raise the slab back to its desired level. The gaps between each slab were removed and the patio area is now completely level. Not only did we raise this homeowners pool deck back to its original state, we also sealed the joints using Nexus Pro Joint Sealant to protect the concrete slabs from future damage from natural causes. A homeowner in Chester, New Jersey had a pool patio that was sinking about 2 inches and contacted Quality 1st for a solution. PolyLevel was installed to raise the concrete back to its original position. PolyLevel is a polyurethane foam that is injected into the concrete through specialized equipment and starts to raise the concrete within minutes. PolyLevel can be installed quickly and the homeowners can use their pool the same day! With help from our System Design Specialist, Tom Carrano, and Foreman, Juan Garcia, Quality 1st Basements was able to transform this musty and damp basement into a dry and healthy space! Our team installed not only a full basement waterproofing system but also removed the bottom portion of the basement walls that were damp from water seepage. Juan and his crew installed our EverLast Wall Restoration Panels that are waterproof and mold resistant. These panels help keep the basement dry by forcing any water seepage directly down to our WaterGuard drainage system. EverLast Wall Panels have built-in insulation to create a more comfortable environment for your friends and family to enjoy. A homeowner living in Howell, NJ had a driveway with sinking slab and was looking for a solution. The homeowner had received a Valpak coupon in the mail and decided to call for a free estimate. System Design Specialist, Tom Corrano, gave an estimate on the homeowner's drive and recommended PolyLevel as it would raise the concrete slabs with ease. The PolyLevel was injected underneath the concrete slabs by the Project Manager, Arturo Jacuinde, and his crew. The homeowner was pleased with the work done by Quality 1st and relieved that they no longer had to worry about the trip hazard. A homeowner living in Howell, NJ had noticed that the concrete slabs around their pool had settled about an inch which created a tripping hazard. 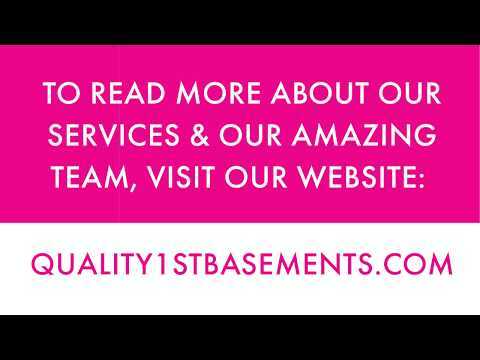 Looking for someone to offer a solution to their issue, the homeowner discovered Quality 1st Basements and contacted them for a free estimate. System Design Specialist, Tom Carrano, gave an estimate and recommended Polylevel as it would easily level out the concrete slabs. Project Manager, Arturo Jacuinde, injected PolyLevel into the concrete slabs and removing the tripping hazard. Now the homeowner can safely enjoy their pool. A homeowner contacted Quality 1st Basements after noticing water in multiple spots of the basement. There was water seepage on the floor near the corners of the basement walls that would then flow out towards the middle of the space. The walls were damp and their was a musty odor beginning to form. Each time it rained hard or snowed that water would eventually find its way in. The Howell, NJ homeowners wanted a solution that would protect their basement against water and give them peace of mind of never having to worry about a wet and smelly basement again. System Design Specialist, Tom C. designed a solution that would be the ultimate solution to their water concerns. Our foreman, Melvin and Eric installed a full Perimeter WaterGuard French Drain system to provide the entire basement with 100% protection against any rain storm. Our SuperSump pump system collects any water captured from our WaterGuard and pumps it out of the basement and away from the foundation of the home. A Mount Olive Township homeowner had noticed their concrete patio entrance had sunk and cracked. The homeowners contacted Quality 1st for a solution. Sinking concrete is a common problem, but it is an easy fix. Our team used PolyLevel, a polyurethane foam to level the sinking concrete. The foam is injected into the concrete through penny-size holes that are drilled in the concrete. The PolyLevel begins working within 30 minutes and the concrete is leveled back to its original position. This solution is environmentally safe, quick, and a permanent solution. A homeowner in Brick, NJ was concerned that their concrete walkway had settled over time and decided to take action as it provided a dangerous tripping hazard. After booking their free estimate with Quality 1st, Richard Kurk, Polylevel foreman and his crew injected polyurethane foam underneath the concrete slab and was able to lift and level the horrendous tripping hazard that could have cause tragedies. The process was done quick and flawlessly. The homeowner was extremely pleased as the results spoke for themselves. To fix the sinking slabs around this pool area, we lifted the concrete using PolyLevel Technology. PolyLevel is injected beneath the concrete slab to fill the void between the slab and the soil. Homeowners often choose to lift their concrete rather than replace it because the PolyLevel installation involves minimal disruption, the concrete that has been lifted can be used 15 minutes after the installation, and it is permanent solution. The front porch of this beautiful Belmar, NJ home was sinking and settling. Quality 1st Basement Systems used PolyLevel to lift the porch back to its original state. PolyLevel will stabilize the concrete porch to prevent further settlement. The homeowner was 100% satisfied with the work done by Quality 1st Basement Systems. A homeowner in Cranford, New Jersey had an old sump pump in their finished basement and needed it replaced. The homeowners contacted Quality 1st for a new sump pump. TripleSafe sump pump was installed to replace the existing old sump pump. The TripleSafe has three levels of pumps built in to ensure the basement stays dry even if one pump fails. The TripleSafe comes with an UltaSump battery backup, set at the highest level will pump 11,500 gallons of water or more on a fully charged battery. The TripleSafe provides the ultimate protection for issues with water in the basement, which was the case with these homeowners. A homeowner in Middletown, New Jersey was experiencing water in their basement during heavy rains and contacted Quality 1st about a waterproofing solution. WaterGuard was installed along the perimeter of the basement, underneath the floor slab on top of the foundation footing to keep the system out of the mud zone. The WaterGuard collects water that seeps through the basement walls and drains it to the sump pump. WaterGuard installs quickly and has a clean finished appearance, meaning there is no unsightly drain around the basement. After noticing that their home had a musty smell to it, this homeowner contacted Quality 1st Basements. Tom Carrano, one of our System Design Specialists, went out to inspect their crawl space and determined that the moisture and damp debris in the space was the cause of the smell. Tom was able to come up with a solution and to the problem. To prevent water vapor and humidity from passing through this crawl space, our team installed our patented CleanSpace Vapor Barrier. The inorganic material of the CleanSpace Vapor Barrier prevents mold growth and mildew. The homeowner now has a dry, you protected and mold free crawl space. A homeowner living in Middletown contacted Quality 1st Basements when they noticed that the concrete slabs surround their pool had settled. System Design Specialist, Tom Carrano, gave an estimate of the homeowner's pool deck and recommended PolyLEVEL to raise the settled concrete. Project Manager, Arturo Jacuinde, and his team injected PolyLEVEL into the concrete slabs, raising them back to level. The homeowner was 100% satisifed with the work done by Quality 1st Basements. Check out this amazing before and after! Our PolyLevel Foreman, Richard, injected PolyLevel foam underneath the sinking slab, raising it back to level. PolyLevel is environementally friendly and waterproof!